Once you’ve removed some (or all) of the grass in your yard – or even if you haven’t removed any of it – you don’t want to stop finding ways to save water. And when you do water your plants, you want to water smartly, right? We have some tips. First, remember that even drought-tolerant plants need some water, especially when they are being established. They will need more water during the establishment phase as well as more frequent watering. Make sure the water gets down to the bottom of the rootball of your new plant(s), but any deeper than that and you’re just watering the ground, wasting it. Second, make a plan for what you will and won’t water. If you still have a lawn, let it go brown as much as you can stand in the summer. Water it sparingly. But do water your trees and larger shrubs. They take more water than smaller plants, because duh, they are bigger. They are also more important to us as a community resource. Trees offer shade, which reduces temperatures – even in your home. Then you spend less money on air conditioning. Everyone likes that! 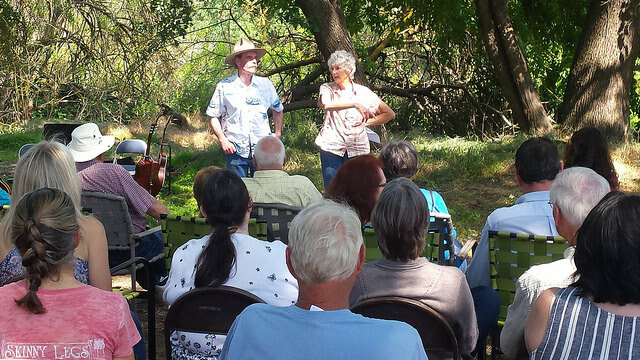 Trees also help clean our pollution-laden air, which is pretty dang important in the San Joaquin Valley. We need more trees, not fewer, so keep your alive. But of course that leads to the question – how much do you water? When? How often? Where? Of course to some degree it depends on the kind of tree, and its size, but we have a few tips. Take into account the size of the plant you are watering. Bigger needs more. The line the tree’s canopy makes is a good indicator of where to put the water for your bigger specimens – the roots will go from the tree outward about to that line. When do you water? Best to do it when there’s the least chance of it evaporating. In other words, when it’s not the heat of the day. Thanks to our dry climate, watering at night is not an issue, but past 8 a.m. and you will likely lose some of the water to evaporation. What type of soil do you have? Clay-type soil structures are almost microscopic in size, and compress like sheets of paper, which means they hold more water. You don’t have to water so much with this type of soil (although you might get root rot if you overwater and the soil retains too much H2O). Sandy soils have larger sized particles so water and nutrients can flow through easily, meaning its hold on water isn’t much, so you have to water more often. Sandy loam type soils are a mixture. In fact, most soils here in the Valley are a mixture, although most are a higher percentage of one type. Fall and winter are the best times to put in new plants, because even though the air is cool and plants’ tops are dormant, the ground doesn’t freeze so roots keep growing. As most of our rain comes during this season, you likely won’t have to water as much to get your new plants established, and by spring they will be ready to grow above ground. Want to make your watering last longer? Use organic material, such as mulch, bark or compost, when planting to aid in water retention. Studies show a 3- to 4-inch layer can save approximately 30% of the water you use. 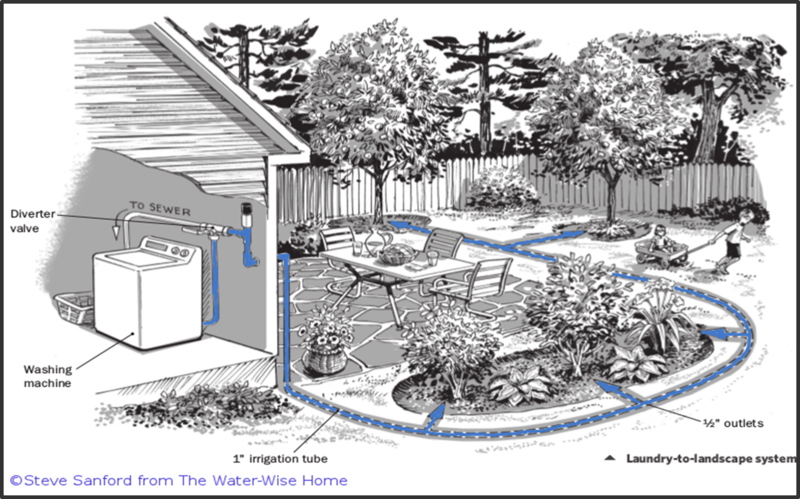 One last thing on watering your plants and trees during the drought: Think about reusing water! Every drop counts, so when you are going to dump out the dog’s water bowl or a bowl of ice you cooled hard-boiled eggs in, don’t pour it down the drain! Take it outside and empty it on a tree. Do you run your shower or a sink for a while, waiting for the water to heat up? Get a bucket to run the water into, and use it to make tree drinks. SRT will soon have shower buckets for sale, more info on that is forthcoming. You can reuse gallons and gallons of water every day using buckets or pails in your tubs and sinks. Finally, if you are the handy sort, consider a gray water system for your washing machine. You can install a basic laundry-to-landscape system without getting a permit, and the water that would drain out of your washing machine instead gets piped out to the trees or plants you choose. Showers can also be hooked up for reuse but it’s more complicated and you need a permit from your city or county. We’ll talk more about that in our next story.